With thorough knowledge and experience in this industry, we are manufacturing and importing a qualitative range of Heat Exchangers. 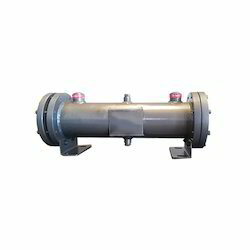 Our experienced professionals have manufactured these heat exchangers using optimum quality raw material, which is obtained from the reliable vendors of market. In this range, we are offering Glass Condenser, Immersion Heat Exchangers, Glass Boiler, Product Coolers and Shell And Tube Heat Exchangers. 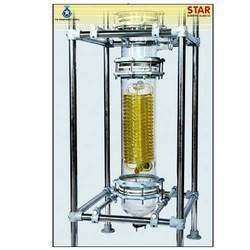 These heat exchangers are widely used in the laboratories of schools and universities. We manufacture and supply our clients with this range of Glass Heat Exchangers (Coil Type and Shell & Tube Type) that have been made from best quality raw material. Used for a variety of purposes such as condensation, vaporization, cooling and heating of liquid. We have these with us available in various combinations such as Glass, metal and FRP. Inlet Temperature 30 degree c.
Our company is offering our clients with this range of Coil Type Heat Exchanger. These exchangers are widely used for their varied use of condensation of vapors and cooling fluids. We have stringently checked these exchangers on industry defined parameters prior to their dispatching to the respective customers. 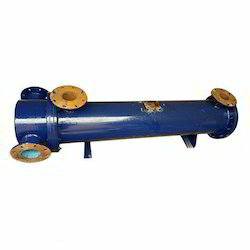 The coil included in this exchanger range is made of high quality heat exchanger that happens to be a good conductor of heat. Provided by us is a comprehensive gamut of Heat Exchangers that are generally of two basic types such as coil types, shell & tube types. All these exchangers are in in glass design and for better heat exchange we have ensured that there is no other kind of internal sealing problem. The coil battery is well welded into a jacket that makes a one piece unit. Basically, these are used in the purposes of condensation of vapors and cooling of liquid. 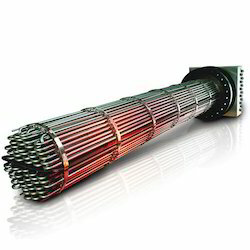 Immersion Heat Exchangers are used to control exothermic reactions in glass vessels. In most applications, cooling water is used in the coils, but they can also be used with steam. In the latter case the coils must always be completely immersed in the liquid. The maximum pressure in the coils is 3.0 bar g. the maximum differential pressure across. Area (m²) DN DN1 DN2 L L1 D Cat. Ref. Size 1" - 3.5 "
Industrial Spacers are used to make up small increments in length and are fitted between standard buttress end components. When incorporating spacers, longer coupling bolts are required together with an additional gasket. Shell And Tube Heat Exchangers are available in various option depends upon required application, which are mentioned as under. Shell and tube heat exchangers are particularly suitable for application where large heat transfer area is required in relatively confined space. 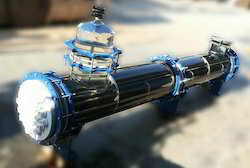 Shell & tube heat exchangers are available in single-pass as well as multi - pass on tube side. 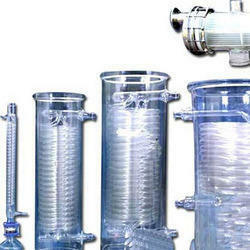 Material of Construction of tube is Borosilicate Glass (3.3). The glass tube are sealed individually into PTFE tube sheet with special PTFE sockets and packing. 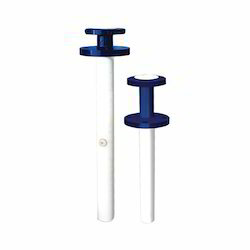 This unique ferrule type selling arrangement permits easy replacements and cleaning of tubes. Baffles on shell side ensure improved heat transfer by increased turbulence. Further details of construction can be seen in the diagram. Type Sheb 4, Sheb 6 and Sheb 9 Glass Boiler are normally mounted in external circulatory loops using a spherical vessel as the main still. They should not be installed in the bottom of a flask or column. The other types of glass coil-type boilers detailed on this page are again mounted in circulatory loops but as their nominal bore is same at the top and bottom, these units can, under certain circumstances, be installed one above the other to achieve multiples of the basic heat transfer area. The maximum pressure in the coils is 3.0 barg. The maximum differential pressure across the coils is 3.0 bars. Please refer to the performance data for glass coil-type.